The European Academies’ Science Advisory Council (EASAC; Halle, Germany) recently released a publication that updates a previous 2013 EASAC report with new data showing that extreme weather events have become more frequent during the past 36 years. The new findings — which confirm the conclusions in the original report and extend the previous analysis — reveal a significant uptick in floods and other hydrological events compared even with 5 years ago. 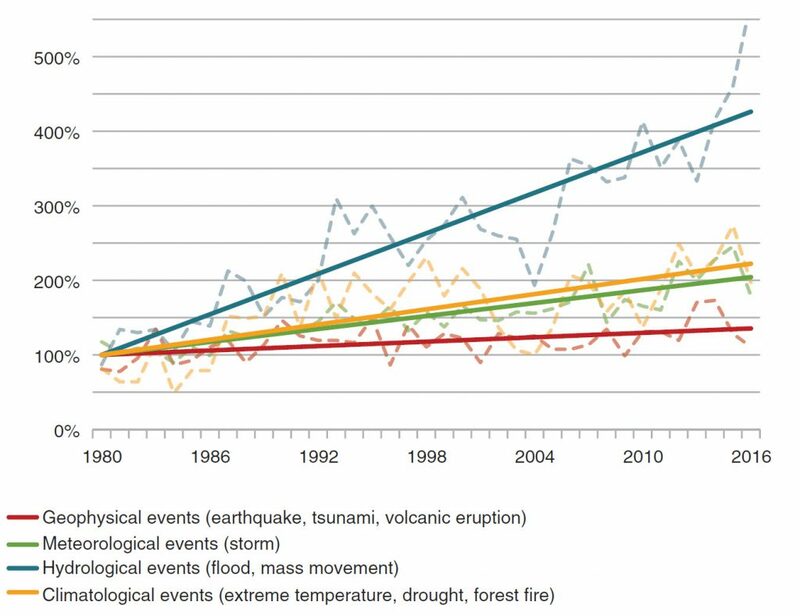 According to the publication, Extreme weather events in Europe: Preparing for climate change adaptation: an update on EASAC’s 2013 study, the number of floods and other hydrological events globally have quadrupled since 1980 and have doubled since 2004, while climatological events — such as extreme temperatures, droughts, and forest fires — have more than doubled since 1980. Moreover, meteorological events, such as storms, have doubled since 1980. These trends highlight the urgency of adaptation to climate change, the study recommends. “Our academies conducted a detailed survey of extreme weather trends in the 2013 report to emphasize the importance of looking at future frequencies of extreme weather when planning infrastructure, health protection, and other key societal protections,” said professor Mike Norton, director of the environment programme at EASAC. “The 2013 review concluded there was statistical evidence to support the obvious anecdotal experience of so many people on extreme weather events — that the rate of events related to climate change was increasing. The update adds 4 years of additional data from the insurance industry, showing continued increases particularly in hydrological events,” Norton said. In the 2013 report, the EASAC makes a point that in a complex system such as Earth’s climate, extreme events tend to recur in an irregular mode and are difficult to predict. “We can see the effects of major events such as Hurricane Harvey, but we have to rely on statistics to see whether there is a trend,” Norton said. Based on the increase in frequency of extreme weather events, EASAC has called for stronger attention to climate change adaptation across the European Union and for leaders and policy-makers to improve the adaptability of Europe’s infrastructure and social systems to a changing climate. “In Europe, the need to adapt is now widely factored into both national and local planning for infrastructure, housing, and response to heatwaves,” Norton said. Anecdotal evidence exists that climate proofing is effective. “For instance, mortalities from the more recent heatwaves have been much less than in 2003 due to more effective response to protecting vulnerable groups,” Norton said. And, despite increased hydrological events, river flood losses in Europe show a near-static trend, which “may reflect the effectiveness of better flood protection measures,” he said.